Lying in bed this morning, still half-asleep, an image came into my head. It’s my most creative time, that gap between sleep and full consciousness, because I dream-think rather than trying to leap ahead to a fully-formed idea. This morning’s image was a flower bed, jagged-edged but soft, the colors bathed in the golden light of pre-dawn September morning and thus more subtle than this post-sunrise photo. In that time between sleep and awake, before the more rational part of my brain kicked in, all those edges seemed to represent the transition from sleep to awake, as well as the leap from factual detail to fictional story. My best ideas are sparked by images like this. Most seem quite trivial at the time: A leaf blowing down a street. A photo hanging on a wall. Catching the next wave. A rocky island. Later, when I’m fully awake, I try to transfer them onto the page without losing too much of their potential. My best writing lets the specifics of a scene speak for the larger theme. Letting the reader connect the dots, picking up the breadcrumbs I’ve dropped along the way, is the best way to create that “aha!” ending that makes writing memorable. Tomorrow morning, I hope to wake up slowly again, dream-thinking in images. 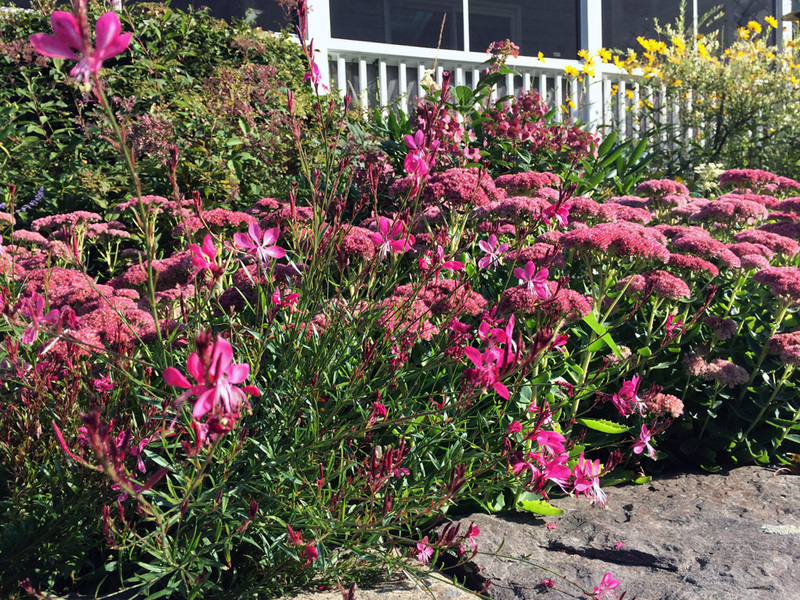 It’s the only time that real September flowers might inspire a garden that doesn’t actually exist yet.